Neurologic complications of kidney disease encompass a diverse spectrum of clinical syndromes and pathophysiologic mechanisms. Neurologic manifestations may be a part of multi-system disorders (e.g., hypertensive encephalopathy, thrombotic microangiopathies, atheroembolic and atherosclerotic disease, vasculitides and septic encephalopathy) which also involve the kidneys. Electrolyte abnormalities like hyponatremia, hypernatremia, hypocalcemia and hypercalcemia have predominant neurological signs and symptoms. Furthermore, patients with impaired renal function are at increased risk of toxin- and pharmacologic agent–induced neurotoxicity. Historically, uremia was described as a constellation of symptoms and signs of disturbances of cognitive, somatosensory, neuromuscular, and autonomic dysfunction in patients with impaired renal function. Earlier recognition and treatment of chronic kidney disease (CKD) has changed the clinical presentation of neurologic illness, further complicating efforts to identify the causative factors. Renal replacement therapy attenuates many of these features of the uremic syndrome, suggesting a role for the retained solutes in the pathogenesis of the complications; however, identification of the responsible solutes remains elusive. Dialysis itself is associated with various neurologic complications, including dialysis disequilibrium at initiation of dialysis therapy, dialysis dementia and peripheral neuropathy in patients on prolonged dialysis therapy. Even patients with kidney transplant may present with signs of calcinuerin related neurotoxicity and central nervous system infections. Cerebrovascular disease is the third major cause of morbidity and mortality in patients with chronic kidney disease. Stroke rates are increased 6-10 fold and stroke mortality 2-3 fold in patients on dialysis. Subclinical cerebrovascular disease is not only a major risk factor for stroke; it plays an important role in the chronic cognitive impairment of kidney disease. Persons with kidney disease have a different risk factor profile. 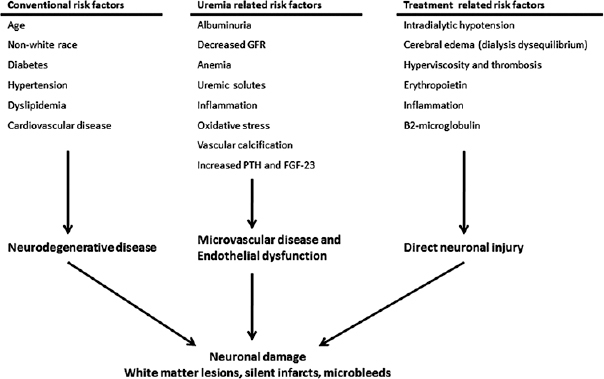 In addition to the conventional risk factors and uremic toxins, other factors that can lead to injury include systemic inflammation, oxidative stress, microvascular disease and dysregulation of sodium, potassium, and aquaporin channels [Figure 1]. Furthermore, detection, management, and prevention strategies usually have lower efficacy and safety in patients with kidney disease as compared to the general population. Identification of the etiology and management of neurologic syndromes remain difficult for nephrologists and requires a multidisciplinary approach. 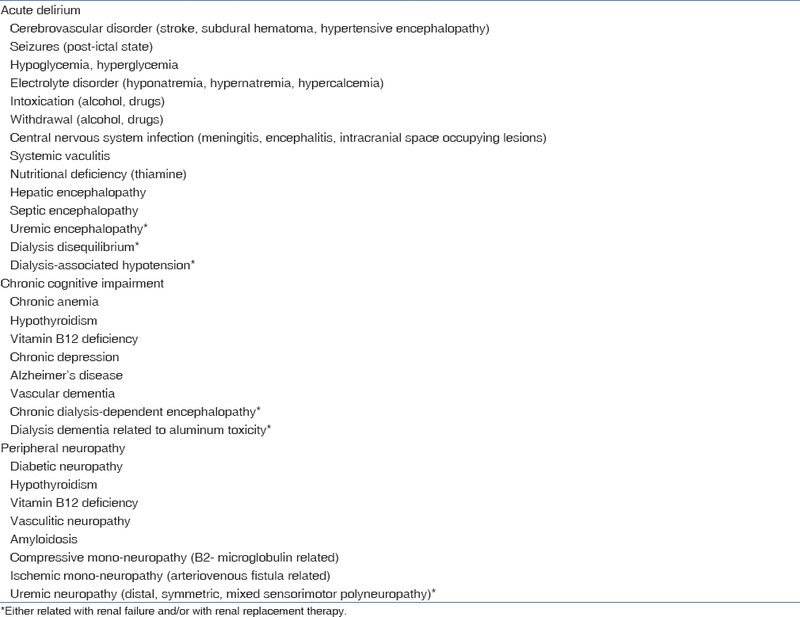 A systematic approach with cause directed investigations is required to identify reversible (and common) etiologies, as uremia related neurologic manifestations are usually a diagnosis of exclusion. Once no definite etiology can be identified, renal replacement therapy is usually considered. Even with adequate renal replacement therapy, many of the manifestations do not resolve and remains a challenge for the treating physician [Table 1]. In this issue, Renjen et al., have reviewed various neurological complications occurring in patients with CKD, which potentially affect the central nervous system (CNS) through to the peripheral nervous system (PNS). Patients with CKD are at risk of developing various symptomatic and occult cerebrovascular diseases. Taal MW, Chertow GM, Marsden PA, Skorecki K, Alan SL, Brenner BM. Brenner and Rector's The Kidney E-Book. Elsevier Health Sciences; 2011. Lu R, Kiernan MC, Murray A, Rosner MH, Ronco C. Kidney-brain crosstalk in the acute and chronic setting. Nature Reviews Nephrology 2015;11:707-19. Tamura MK, Yaffe K. Dementia and cognitive impairment in ESRD: Diagnostic and therapeutic strategies. Kidney Int 2011;79:14-22. Toyoda K, Ninomiya T. Stroke and cerebrovascular diseases in patients with chronic kidney disease. Lancet Neurol 2014;13:823-33. Renjen PN, Chaudhari D, Sagar G, Jasuja S. Neurology of renal disorders. Neurol India 2018;66:163-7.